If you missed Ignite Burlington 2013, you can now catch up on all the speaker action! Up first, is Mrs. Vermont America 2013, Hannah Kirkpatrick (and today is her birthday! Happy Birthday, Hannah!) and Aaron Fastman, a small business entrepreneur based in Burlington. Click below to watch the videos and let us know what you think! We’ll be releasing two videos a week for the next couple of weeks as we gear up to announce Ignite Burlington 2014 speakers! We are still interviewing speakers for this year’s event! We’re looking forward to having a packed house, inspiring the community, and raising funds for Hergenrother Foundation. Our goal is to hold our first Youth Leadership Camp in the summer of 2015! Tickets will be available for sale starting in September. Questions? Need more information? Or want to volunteer? Email info@hergenrotherfoundation.org. This entry was posted in Events, Ignite Burlington, Ignite Speaker and tagged adam hergenrother, btv, burlington vermont fall events, burlington vt, burlington vt events, burlington vt fall events, hannah kirkpatrick, hergenrother foundation, ignite btv, ignite burlington 2013, ignite burlington 2014, ignite burlington vt, main street landing vt, mrs. vermont 2013, mrs. vermont hannah kirkpatrick, recovery rocks, recovery rocks with hannah kirkpatrick, vermont events, vermont fall events on June 19, 2014 by Hallie. As Vermont’s only Board Certified Hypnotherapist with a busy practice in a medical office, Nathalie Kelly knew a lot about the mind’s power to heal the body. Since 1996 she has helped nearly 1,000 clients heal trauma and anxiety, and to develop self-worth and self-confidence. But when a sailing accident left her with a traumatic brain injury, her world was suddenly and tragically turned upside down, putting everything she knew to the ultimate test. This amazing journey has led her to discover a new way to navigate life, leading with her heart and not her head. She is a writer and speaker committed to helping others find the courage to live more authentic and compassionate lives. Her upcoming book is titled, Brainstormed: How I Lost My Mind & Found My Heart. This entry was posted in Ignite Speaker and tagged adam hergenrother, hergenrother foundation, ignite btv, ignite burlington, ignite burlington 2013, ignite burlington vt, ignite vermont, nathalie kelly, vermont hypnotherapist, vermont mind body healer. 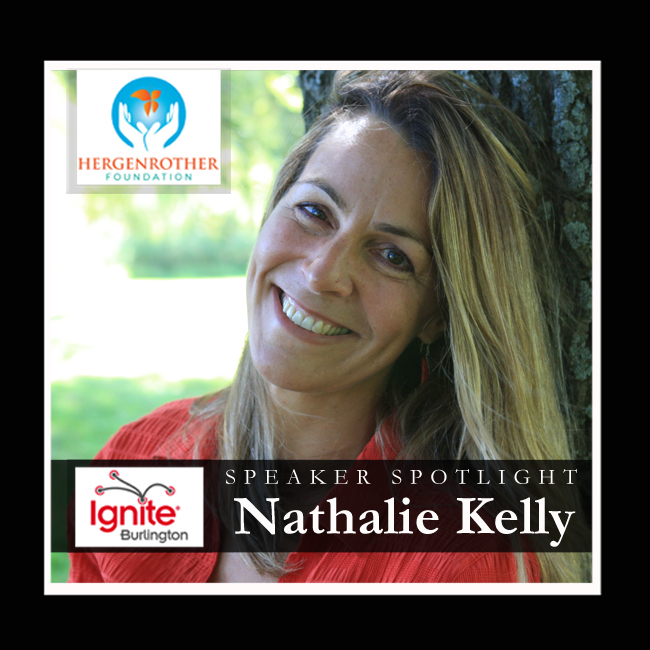 ignite speaker spotlight on September 30, 2013 by Hallie.